Catherine Martin on Ms. Pamela Martin, I salute and thank you! Ray Tumenta on Professor Daniel Noni Lantum – I salute you! (Final Part). JUDITH Kibuh on Professor Daniel Noni Lantum – I salute you! (Final Part). AFRICAphonie is a Pan African Association which operates on the premise that AFRICA can only be what AFRICANS and their friends want AFRICA to be. Spotlight on Bakweri Society and Culture. The Bakweri are an indigenous African nation. Bate Besong, award-winning firebrand poet and playwright. Dr Bernard Fonlon was an extraordinary figure who left a large footprint in Cameroonian intellectual, social and political life. Website of the Literary Award established to honor the memory of BERNARD FONLON, the great Cameroonian teacher, writer, poet, and philosopher, who passionately defended human rights in an often oppressive political atmosphere. George Ngwane is a prominent author, activist and intellectual. Virtuoso guitarist, writer and humorist. Former lead guitarist of Rocafil, led by Prince Nico Mbarga. The refreshingly, unique, incisive and generally hilarous writings about the foibles of African society and politics by former Cameroon Life Magazine columnist Martin Jumbam. Professor of Medicine and interventional cardiologist, Nowa Omoigui is also one of the foremost experts and scholars on the history of the Nigerian Military and the Nigerian Civil War. This site contains many of his writings and comments on military subjects and history. A UMI (United Media Incorporated) publication. Specializing in well researched investigative reports, it focuses on the Cameroonian scene, particular issues of interest to the former British Southern Cameroons. Victor Wacham Agwe Mbarika is one of Africa's foremost experts on Information and Communication Technologies (ICTs). Dr. Mbarika's research interests are in the areas of information infrastructure diffusion in developing countries and multimedia learning. A West African in Arusha at the International Criminal Tribunal for Rwanda on the angst, contradictions and rewards of that process. Renaissance man, philosophy professor, actor and newspaper columnist, Godfrey Tangwa aka Rotcod Gobata touches a wide array of subjects. Always entertaining and eminently readable. Visit for frequent updates. Prolific writer, social and political commentator, he was a professor at University of Buea and University of Botswana. 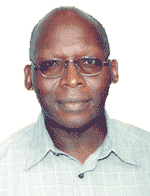 Currently he is Head of Publications and Dissemination at CODESRIA in Dakar, Senegal. His writings are socially relevant and engaging even to the non specialist. Novelist and poet Ilongo Fritz Ngalle, long concealed his artist's wings behind the firm exterior of a University administrator and guidance counsellor. No longer. Enjoy his unique poems and glimpses of upcoming novels and short stories. The award-winning blog of Dibussi Tande, Cameroon's leading blogger. Rosemary Ekosso, a Cameroonian novelist and blogger who lives and works in Cambodia. Blog of George Esunge Fominyen, former CRTV journalist and currently Coordinator of the Multi-Media Editorial Unit of the PANOS Institute West Africa (PIWA) in Dakar, Senegal. Stephen Neba-Fuh is a political and social critic, human rights activist and poet who lives in Norway. A no holds barred group blog for all things Cameroonian. "Man no run!" Spotlight on the Bakweri Society and Culture. The Bakweri are an indigenous African nation. The Universal Church celebrates Sunday, January 20, 2019, as the Second Sunday of Ordinary Time – Year C. In the entrance antiphon we pray: “May all the earth give you worship and praise, and break into song to your name, O God, Most High. Amen.” The sacrament of matrimony is very much at the center of this day’s Eucharist. In the first reading, the prophet Isaiah tells us that the Messiah will restore the relationship between God and his people that has all the love of a perfect marriage. God will make his people holy and will rejoice in them as the bridegroom rejoices in his bride. In the second reading, Saint Paul speaks to his converts of Corinth about the variety of gifts with which God has endowed them. These various gifts are to be used for the common good of all, and for building the Christian community, which is the Church of which Christ is the head. In the Gospel, Saint John tells us about the first miracle Christ performs after his baptism: he changes water into wine, at the request of his mother, Mary, to save a young couple from embarrassment. With his presence at the wedding feast of Cana, Jesus sanctifies the sacrament of marriage as a union of one man and one woman, which is a sign of his own relationship with the Church. In the course of this Eucharist, let us pray for the grace to receive Jesus into our own homes, through family prayers, and into our hearts so that he may fill them with the wine of compassion, understanding and love so we can receive all who come to us this day with open arms, especially the stranger and the lonely. First Reading: Isaiah 62: 1-5. For Zion’s sake I will not be silent, for Jerusalem’s sake I will not be quiet, until her vindication shines forth like the dawn and her victory like a burning torch. Nations shall behold your vindication, and all the kings your glory; you shall be called by a new name pronounced by the mouth of the Lord. You shall be a glorious crown in the hand of the Lord, a royal diadem held by your God. No more shall people call you “Forsaken, “or your land “Desolate, “but you shall be called “My Delight,” and your land “Espoused.” For the Lord delights in you and makes your land his spouse. As a young man marries a virgin, your Builder shall marry you; and as a bridegroom rejoices in his bride so shall your God rejoice in you. V/ The word of the Lord. R/ Thanks be to God. The third part of the book of Isaiah, from where our reading is taken, was written against the backdrop of problems that arose in Judah, particularly in Jerusalem, when the exiles came back home. The initial enthusiasm of those returning from exile was quickly dampened by the harsh realities they met on the ground: the land of Judah lay in ruins, those who never went into exile considered those returning as strangers, who had no right to the land, and tensions quickly developed between the two communities. The hope of a glorious new era for the returnees did not materialize and the task of restoration was slow and difficult, and while the majority of the people lived in poverty, the well-to-do shamelessly exploited the poor and the weak. That is when the prophet steps in to revive the hopes of his people for a better future. He calls for the introduction of a purer form of religious worship that is not based on externals. His message encourages the people to remain faithful to the God of Israel, to be sincere in their religious practices and to look forward in hope to a wonderful restoration of Jerusalem, the Holy City. In the passage of our meditation, the prophet praises Jerusalem, depicting Zion as the spouse of the Lord. He reassures the people that none of them will ever again feel lonely and unprotected in God’s city, Jerusalem, to which God has shown his tenderness; even the nations of the earth will recognize her as God’s “Delight”, and his “Wedded” one. He tells those living in the Holy City to be prepared for the day the Lord will enter in glory and take possession of his city and of those living in it. What lesson do I take from this reading? It contains a message of hope for all those who have experienced the destruction and desolation caused by sin: God does not abandon them, just as he did not abandon Jerusalem when she betrayed him. He still made her his spouse and loved her. Our God is therefore a God of compassion and mercy, who is quick to forgive us our trespasses. Let us imitate him by also forgiving others their own trespasses and showing mercy to the weak and the marginalized of our society. dLet us show mercy to others and God will make us his own people, his “Delight”, his “Wedded One.” Amen. Second Reading: 1 Cor 12: 4-11. Brothers and sisters: There are different kinds of spiritual gifts but the same Spirit; there are different forms of service but the same Lord; there are different workings but the same God who produces all of them in everyone. To each individual the manifestation of the Spirit is given for some benefit. To one is given through the Spirit the expression of wisdom; to another, the expression of knowledge according to the same Spirit; to another, faith by the same Spirit; to another, gifts of healing by the one Spirit; to another, mighty deeds; to another, prophecy; to another, discernment of spirits; to another, varieties of tongues; to another, interpretation of tongues. But one and the same Spirit produces all of these, distributing them individually to each person as he wishes. V/ Thanks be to God. The city of Corinth was one of the most important commercial cities in the Roman Empire. It was the capital of Achaia (Achaia and Macedonia being the two provinces into which the Romans divided Greece). Since it was a commercial city, it had a cosmopolitan population which included people from Asia Minor, Phoenicia, Egypt, Greece and a Jewish population with its own synagogue to which Saint Paul went as soon as he visited the city (Acts 18:4). It was also a city with many religions and with temples dedicated to all sorts of gods. It was, however, notorious for its low level of morality. Saint Paul preached the Christian message in this city and the Holy Spirit enabled him to found a Christian community there with the help of Silas and Timothy during his second missionary journey (Acts 18: 1-18). Paul had arrived from Athens where he had failed to make many converts despite his brilliant discourse at the Areopagus (Acts 17: 16-34). He was, however, lucky in Corinth where he spent more than a year (50-52 AD), preaching and making converts. But his success led to jealousy and hostility from some influential Jewish authorities, who led a riot against Paul and he was forced to flee from Corinth. The First Epistle, from where our reading is taken, is particularly important from the doctrinal point of view, especially as it has a wide range of subjects on Christian worship. One of the themes he deals with, and which forms part of the reading of this day, is the gifts of the Holy Spirit, which his converts of Corinth were using in an abusive manner. That is why Paul takes such pains to explain in detail what these gifts are and what connection there is between them and the doctrine of the mystical body of Christ. These spiritual gifts, also called “charisms”, are the exceptional graces we receive, not only for our personal benefit, but for the benefit of the Christian community as a whole. The Fathers of Vatican II Council tell us, among other things, that the gifts of the Holy Spirit make God’s people fit and ready to undertake various tasks and offices for the renewal and building up of the Church. “Whether these charisms be very remarkable or more simple and widely diffused, they are to be received with thanksgiving and consolation since they are fitting and useful for the needs of the Church. Extraordinary gifts are not to be rashly desired, nor is it from them that the fruits of apostolic labours are to be presumptuously expected.” The Fathers continue by warning that such gifts should not be used against the Church. That is why “those who have charge over the Church should judge the genuineness and proper use of these gifts” (Lumen gentium, 12). The Holy Spirit can, and does, give extraordinary gifts to the faithful, some of such gifts manifesting themselves in dramatic and noisy ways, as we often see in some charismatic groups, but it is important to note that such extraordinary powers are not the only things that promote the growth of the Church in our Archdiocese. As Saint John Paul II tell us, extraordinary charisms are useful only if they lead “the greatest possible number of the faithful, as they travel their daily path, to make a humble, patient and persevering effort to know the mystery of Christ better and better, and to bear witness to it” (Catechesi tradendae, 72). Let us ask the Holy Spirit to continue to enlighten us with his many gifts, gifts we should put at the service of our Christian community and for the better growth of the society we live in. Through Christ our Lord. Amen. There was a wedding at Cana in Galilee, and the mother of Jesus was there. Jesus and his disciples were also invited to the wedding. When the wine ran short, the mother of Jesus said to him, “They have no wine.” And Jesus said to her, “Woman, how does your concern affect me? My hour has not yet come.” His mother said to the servers, “Do whatever he tells you.” Now there were six stone water jars there for Jewish ceremonial washings, each holding twenty to thirty gallons. Jesus told them, “Fill the jars with water.” So they filled them to the brim. Then he told them, “Draw some out now and take it to the headwaiter.” So they took it. And when the headwaiter tasted the water that had become wine, without knowing where it came from — although the servers who had drawn the water knew —, the headwaiter called the bridegroom and said to him, “Everyone serves good wine first, and then when people have drunk freely, an inferior one; but you have kept the good wine until now.” Jesus did this as the beginning of his signs at Cana in Galilee and so revealed his glory, and his disciples began to believe in him. V/ The Gospel of the Lord. R/ Praise to you, Lord Jesus Christ. Shortly before this day’s Gospel reading, the evangelist John shows Jesus gradually building the team that is going to help him to spread his message to the world. First of all, he calls two curious young men, Andrew and John himself, who are the disciples of John the Baptist. They change camps as soon as John the Baptist points Jesus out to them: “Behold the Lamb of God” (Jn 1:36). Andrew then goes for his brother Simon, whom Jesus renames “Cephas” or “Rock”. Shortly thereafter, Jesus invites Philip who in turn invites Nathaniel (Bartholomew), who is surprised that anything good can come out of Nazareth (Jn 1:46). We imagine that this is the group that is around Jesus when he is invited to the wedding feast at Cana. They are still, for the most part, timid and largely unsure of the person they are following. It will not be long, however, before their faith in him begins to firm through the first miracle he performs in their presence – changing water into wine. Jesus and his mother, Mary, have been invited to a wedding feast and he takes his disciples along with him. There he performs the first miracle recorded by the evangelist John – the young couple runs out of wine and, at his mother’s intervention, Christ saves them from embarrassment by turning water into wine. In his beautiful book, Harden not your Hearts, Cameroonian Jesuit priest, Reverend Kizito Forbi, examines the importance of inviting Jesus into our homes and into our hearts. There are many other occasions in the Bible, he reminds us, where Jesus has been invited into people’s homes and there he has always performed a miracle. Peter invites Jesus into his home and the first thing he does is to cure Peter’s mother-in-law, who has been in bed with a fever (Lk 4: 38-39). The fraudulent tax collector of Jericho, Zaccheus, invites Jesus into his home; the two talk for a while and Zaccheus emerges from that encounter a changed man. He vows to give up half of his possessions to the poor and to pay back those he has cheated four times over (Lk 19: 18). There is the moving scene on the road to Emmaus on Easter night. Cleopas and his companion invite the one they believe is a complete stranger to stay the night with them instead of risking night travel. Jesus ends up celebrating the first Eucharist after the Last Supper with them. Once they recognize the Risen Lord, the sad pilgrims become bold missionaries, who defy the dangers of the night to take back the good news of their Lord’s resurrection to the rest of the disciples (Lk 24:30). What lesson do I learn from these examples? They show me that whenever I invite Jesus into my heart or into my home, he will always perform a miracle for me and my family. Jesus never visits a home without leaving something special behind. Inviting Jesus into our home changes our family life for the better. And how do we invite Jesus in? Through prayers, of course. Our lives are sometimes as flat as water until Christ blesses them, thus transforming our sorrows into joy, and our tears into laughter. How else can we invite Jesus into our homes? This can be done through the intercession of the Blessed Virgin Mary, his mother. The miracle of this day takes place because Mary intervenes and her Son obeys her. She is always attentive to our needs and supplications, which she faithfully transmits to her Son, who always listens to her and fulfils all her requests. At this wedding feast, her request is simple: “They have no wine” and then turning to the servants she says: “Do whatever he tells you.” So whenever we turn to our Lady in prayer and invite her into our homes and hearts, she takes our plea to her Son. Once she sees that the wine of life is running out, and our life is dreary and lukewarm towards spiritual deeds, she will tell her Son, “They have no wine”. Obedient as her Son is, he will then ask us to fill the jars of our lives with water. Why does he ask us to fill the jars with water, instead of doing it himself? It is because he always wants us to cooperate with him before he saves us. As Saint Augustine says: God who made us without us, will not save us without us. Through our cooperation, Christ will then turn our lives into wine – the wine of joy and happiness. Let us pray during this Eucharist that Jesus and his mother, Mary, may come into our homes and into our hearts and bless them and fill them with the sweet wine of happiness. May they also enter every home in our Archdiocese, bringing the sweet wine of joy and understanding where there is sadness and discord. Bless the doors of our homes and of our hearts, Lord, and help us to keep them open to the poor and those in need. Through Christ our Lord. Amen.